In our October issue, we featured a recipe for Nanaimo Bars that called for digestive biscuits. These traditional British cookies resemble graham crackers in taste—they’re both made with whole-wheat flour—and they’re as ubiquitous and popular there as Oreos are here. 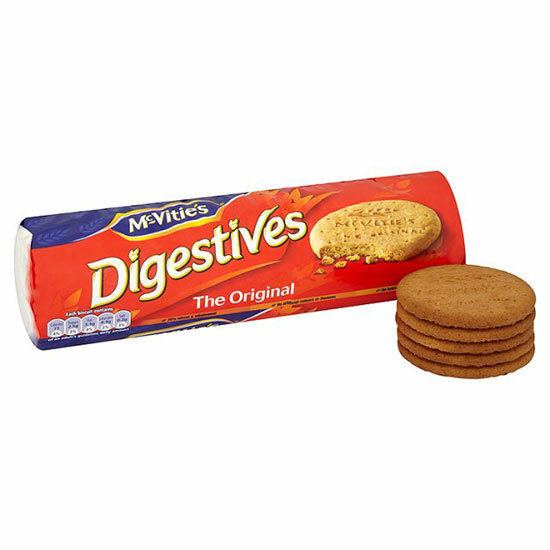 Digestive biscuits have been around for almost 150 years. Like graham crackers and vanilla wafers, the plain biscuits are often broken up and folded into pudding-like desserts; crushed and used as a crisp, sweet topping; or finely ground and used to make cookie crusts. They’re also delicious dunked into a cup of coffee or tea, but you have to act fast as the cookies fall apart quickly! The biscuits come plain or topped with milk or dark chocolate, and the most popular brand is McVitie’s; the chocolate version is also sold by the French cookie company LU. They’re available in the cookie section of well-stocked supermarkets, at specialty food shops and online from Amazon.com.